UBTech recently held a regional SkillsUSA Competition at the Vernal campus. 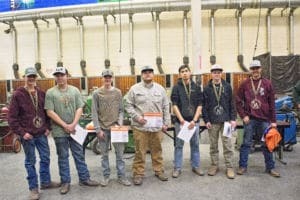 Students from both campuses competed against each other to hone skills they have learned in their respective Automotive, Welding, and Carpentry programs. Local industry also participated in these competitions by assisting as judges and donating prizes. 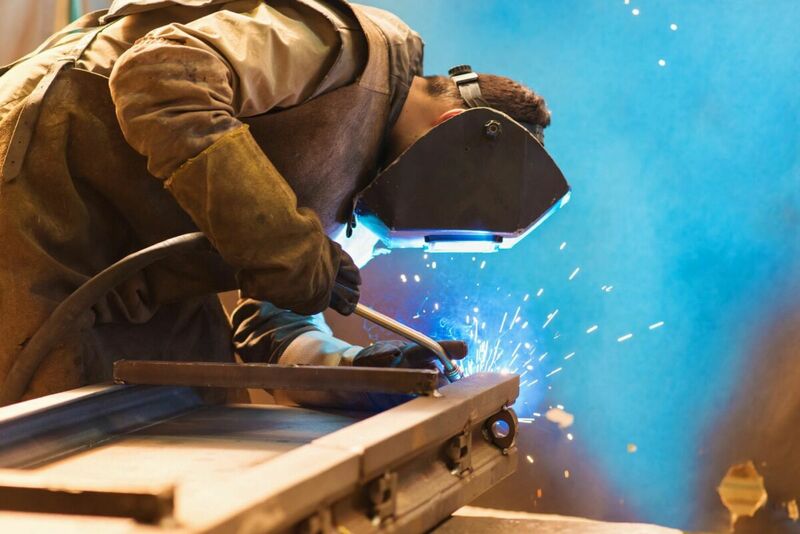 Welding students competed as individuals in beginning and advanced divisions. Automotive students went head-to-head and Carpentry students competed in two-man teams which included both secondary and adult students. Welding winners in the beginning divisions: Treven Timothy, first place; Josh Roberts, second place; David Raven, third place; and Tracen Timothy, fourth place. In the advanced division: Dalton Van, first place; Derek McKeachnie, second place; Baldo Naverrete, third place; and Branson Gross, fourth place. Automotive winners are: McKinlee Thacker, first place; Kamen Williams, second place; Brenden Van Dyke, third place; Brexton Mortenson, fourth place; and Koby Thacker, fifth place. 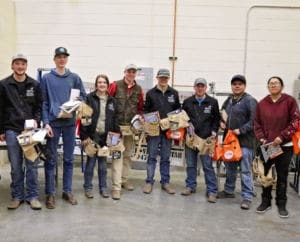 In the secondary Carpentry competition, the two-man team winners are: Austin Olson and Masen Holmes, first place; Hayden Boren and Tymarie White, second place; and Jesse Anderson and Mason Tait, third place. The winning team for post-secondary students was Jubal Myore and Julianna Queacut. CDL students joined in the competition just for fun and competed in 90-degree backing and a pre-trip evaluation. This was an in-house competition that was not affiliated with SkillsUSA. In 90-degree backing, Jace Prather placed first and Matt Goodrich placed second. In the pre-trip evaluation, Pete Butcher placed first and Bryce Nielson placed second. McKinlee Thacker received honorable mention for being a secondary student in the CDL program and competing in both the Automotive and CDL contests. Click HERE to see the highlight video! Automotive winners at UBTech’s intercampus SkillsUSA competition. Pictured left to right, McKinlee Thacker, first place; Kamen Williams, second place; Brenden Van Dyke, third place; Brexton Mortenson, fourth place; and Koby Thacker, fifth place. Prizes were donated by Mac Tools, Showalter Ford, and O’Reilly Auto Parts. Carpentry winners from UBTech’s intercampus SkillsUSA competition. Students competed in two-man teams. 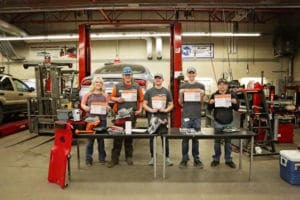 Pictured left to right, Jesse Anderson and Mason Tait, third place; Tymarie White and Hayden Boren, second place; Austin Olson and Masen Holmes, first place; and the winning team for post-secondary students Jubal Myore and Julianna Queacut. Prizes were donated from Roofing World Home Improvement Center. Welding winners at UBTech’s intercampus SkillsUSA competition. Left to right, beginning division; Treven Timothy, first place; Josh Roberts, second place; (not pictured David Raven, third place) Tracen Timothy, fourth place; advanced division; Branson Gross, fourth place; Baldo Naverrete, third place; Derek McKeachnie, second place; Dalton Van, first place. Prizes were donated by Miller and Norco. CDL winners from UBTech’s intercampus SkillsUSA Competition. 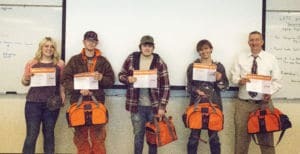 Pictured left to right, McKinlee Thacker, Honorable Mention; Matt Goodrich, 90-degree backing second place; Jace Prather, 90-degree backing first place; Bryce Nielson, pre-trip evaluation second place; and Pete Butcher, pre-trip evaluation, first place. Prizes were donated by UBTech.